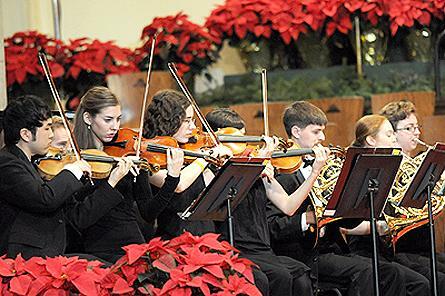 The program of Christmas carols and anthems is presented by the college’s department of music and features more than 200 students in four services in historic Dimnent Memorial Chapel. Participants this year will include Hope’s College Chorus, Chapel Choir and Symphonette, as well as organists and instrumental ensembles. Christmas Vespers was first held on Sunday, Dec. 7, 1941, at 4 p.m. The timing was fateful—the Japanese had attacked Pearl Harbor only hours before, precipitating the entry of the United States into World War II. The program was sponsored, the “Anchor” student newspaper noted at the time, by the college’s Musical Arts club as the first of a series “designed to give music students of Hope an opportunity to perform in public and to bring to public attention the work of the music school.” Approximately 500 attended, the “Holland Evening Sentinel” reported afterward. Vespers today takes place on a scale that 1941’s organizers could scarcely have imagined. The college regularly starts receiving inquiries about tickets in August, and Hope now presents four services each year in response to interest in the event. For many families, attending has been a highlight for generations. Christmas Vespers is also featured on radio stations around the country each year, and every two or three years is also recorded by and shown on WGVU television and made available to PBS affiliates across the United States. The services were most recently recorded for television in 2011. The ticket office is open weekdays from 10 a.m. to 5 p.m., but will be closed on Thursday-Friday, Nov. 22-23, because of the Thanksgiving holiday. The office can be called at (616) 395-7890.